Toledo, declared World Heritage Site by Unesco in 1986, is located in a rocky hill surrounded by the river Tajo, in central Spain, only 70 km away from the capital, Madrid. 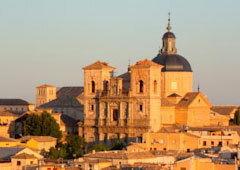 Toledo is considered by many as a second Rome. It is a unique city for its history, culture and charm. The three cultures of the three monotheist religions –Muslim, Jewish and Christian– left their footprint in this city surrounded by the Tajo. The Alcázar is a rectangular fortress built around a patio and located in the highest part of the city. Originally it was a Roman palace (3th c.) which was lately modified under the reigns of Alfonso VI and Alfonso X. It was Carlos V who ordered the master Covarrubias to design the current building. 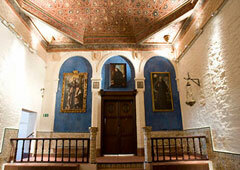 Today, the Alcázar houses the Library of Castile and the collections of the Museum of the Army. 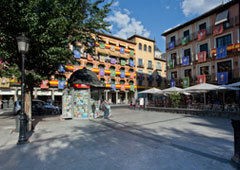 This Square has been the centre of the city for the most part of its history. Its name means “market of beasts of burden” in Arab. Part of it was designed by Juan de Herrera under the reign of Felipe II. Nowadays, it hosts numerous popular parties and is a meeting point for tourists and locals. Also known as Iglesia de San Ildefonso, it is a good example of Baroque architecture in Spain. Built by 1742, its Mirador de las Torres offers one of the best panoramic views of the city. 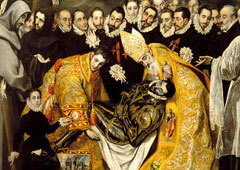 It is the most visited parish church of the city, in part due to the treasure it hides inside: the famous painting The Burial of the Count of Orgaz, by El Greco. The church dates from the 12 th century, although it was rebuilt by the Count of Orgaz in the 14th century and has undergone several modifications since then. Among other things, we can visit: the tower, an interesting example of the Mudéjar art, the marble baptismal font (16 th century), a beautiful sculpture of the Virgin, also in marble (16th c.) or Luis Tristán’s paintings. Located In the very heart of the Jewish quarter, it was inaugurated in 1910. There we can contemplate important paintings by El Greco, such as The Apostle or The Redeemer, and by other relevant painters from the 16th and 17th centuries. 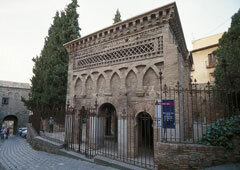 This synagogue was built in Mudéjar style in the 14 th century by Samuel Ha-Levi with the permission of Pedro I of Castile. The austerity from the façades contrasts with the abundant decoration we can find inside. 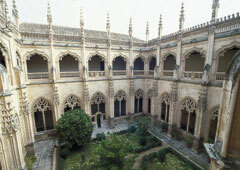 Today, it houses the Museo Sefardí of Toledo. It is the best preserved of the 10 mosques that once existed in the city during the Moorish period. It was built in the year 999, under the Caliphate of Córdoba. It was originally known as Mosque of Bab al-Mardum, but received the name of “Cristo de la Luz” (Christ of the Light) due to the crucified Christ placed in the temple when it was consecrated as a hermitage. 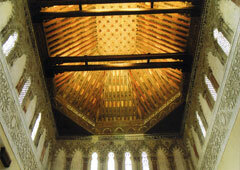 It belongs to the Franciscan Order and is one of the most relevant examples of Gothic-Spanish-Flemish style in Spain. 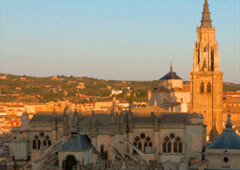 It was built under the patronage of the Queen Isabel I of Castile. It was declared Bien Histórico Artístico de Interés Nacional (Heritage of Cultural Interest) in 1926.